Welcome to Bruno's site about his experiences in his Phoebus, ASW-20B and now ASW-27B sailplanes. I stopped updating this site many years ago but I have continued to make soaring videos on youtube. Join the 10 million+ people who have watched my gliding videos by going directly to my youtube gliding channel. Most of these videos were shot in HD quality. To watch videos in best quality, first, start the video. Click on the HD button that appears at the bottom right of the player. Then, click the button to the right of HD and it will open it up on full screen mode. First soaring video attempt (16.6 MB file). 3 1/2 minute video of first two flights I shot video. Formation with ASW-15 part 1 (3.9 MB file). 1 minute video of an August 2004 formation flight with friend. Formation with ASW-15 part 2 (4.4 MB file). 1 minute video of second part of Aug 2004 formation flight. Here is a 7 part series (to keep downloads reasonable) of a fun local Utah flight in the early fall of 2004. I really enjoyed watching the ridge soaring and beautiful mountains while I edited this for the web. I hope you enjoy! View Flight Map to see where each part was filmed. Family Trip to Yellowstone Park - On June 30, 2007 I took the wife and our 3 kids in a Diamond Star DA40 on our first vacation using a small plane. Both the flights and the park were a fantastic experience for us all. 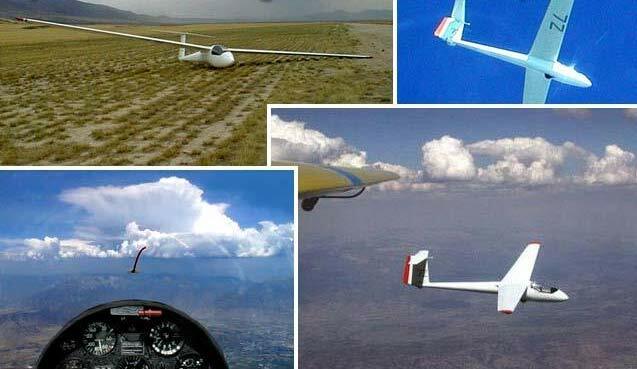 Check out my info page on building a glider camera mount and video system. I talk about how I am starting to take videos from different places mounted on the outside of the glider. Think something is of enough value to take from this site? Please email me to let me know. Copyright 2003-2018 Bruno Vassel IV. All rights reserved.